"After 18 years of relative quiescence, Mount St. Helens volcano recaptured the world's attention when it showed signs of reawakening in September 2004." 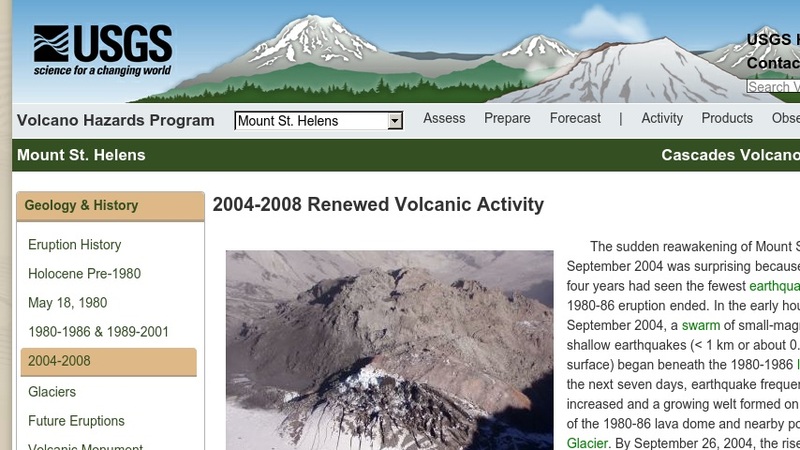 This USGS website offers online factsheets on Mount St. Helens activity from September 2004 through March 2005. Visitors can discover the height of the new lava dome, new technology for monitoring eruptions, and the possible hazards related to Mount St. Helens' activity. The website supplies fascinating topographic images of the changes in Mount St. Helens crater, photos of its new growing lava dome, and more.